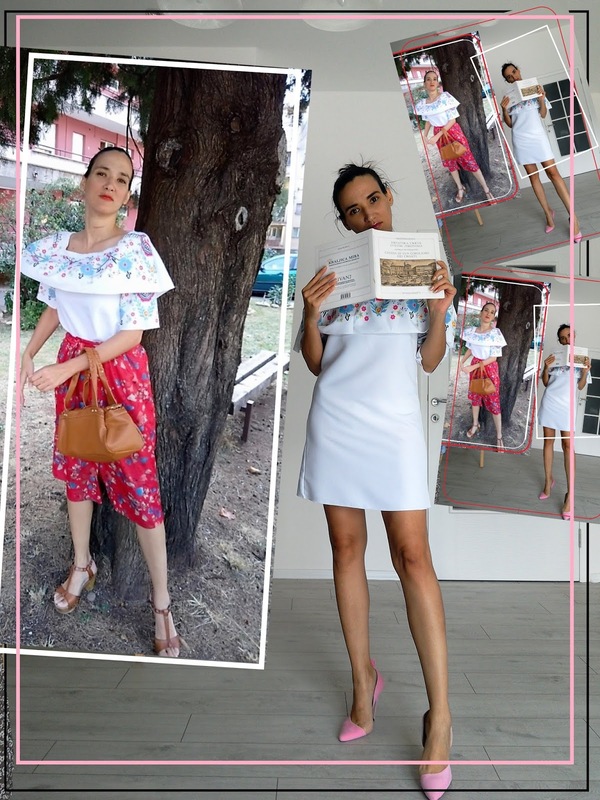 I promised to show you another way to style this white off shoulder dress /tunics, haven't I? 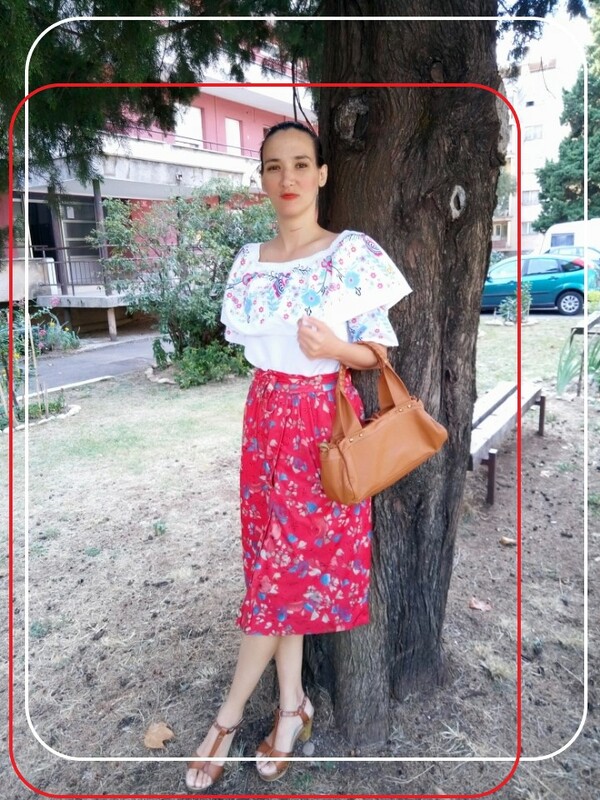 I already wore it with white jeans, and today I'm going to show you how to wear it with a red floral skirt. 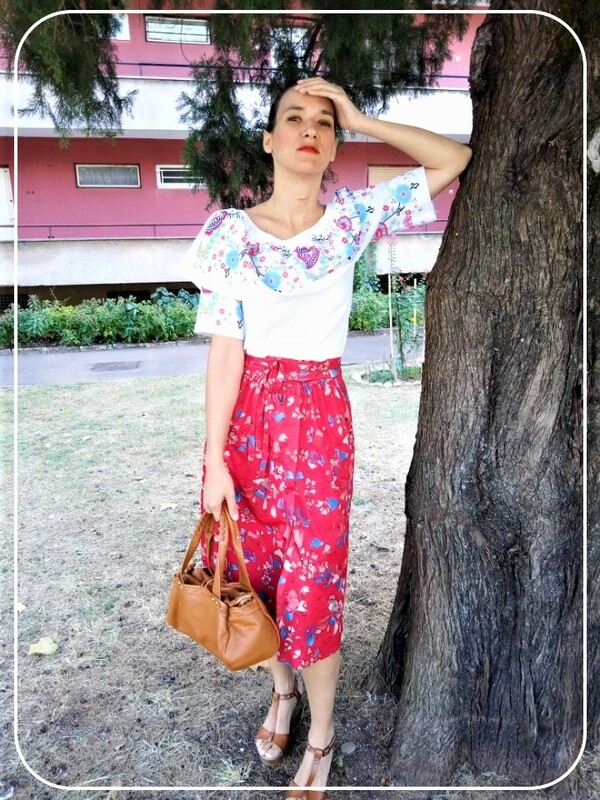 This vintage floral skirt comes from a matching set (I'll show you more photographs bellow). If you own a matching set, there is no need to limit yourself to wearing it in the same way. You can always mix and match. 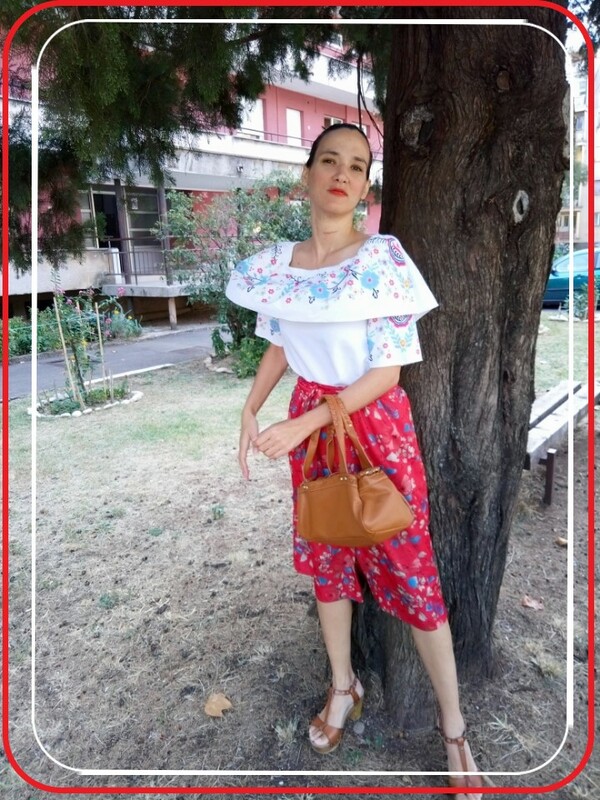 For example, in the outfit you can see bellow, the floral details on the off shoulder dress/blouse match really well with the floral details on the skirt. It's a different floral print, but it looks nice worn together. At least I think so! White and red is always a winning combo if you ask me. There is something about the combination of those two colours that is always eye-catching. Throw in some blue and caramel details and I'm happy as I can be. I guess I'm just a girl who loves colours. Wearing dresses as blouses is nothing new to me. I love dresses and skirts so it makes sense to pair them together. Do more of what you love, wear more of what you love. This habit of pairing skirts and dresses might even be the reason why I don't have many tops in my closet. Why should I buy top and blouses when I can tuck dresses into skirts. If you prefer to wear pants this is a little harder to do, but there is always a way. I wrote more about layering summer dresses in this post, so check it out if you're looking for some inspiration. My ideas for layering summer dresses include : wearing a vest with it, wearing a cropped top over it, wearing a body chain over it, wearing a scarf around your waist, wearing a scarf as a poncho , wearing a regular poncho, wearing a skirt over it, wearing dresses with jeans or jeggings, wearing it with leggings, wearing it with shorts, wearing a crochet or sheer jacket over it. Do you have any ideas to share? When it comes to styling this white off shoulder dress on its own, I opted to pair it with pink heels. What is more feminine than pink heels, right? White and pink colour combo is perfect if you want to create a softer look. I like both outfits, but I think the one with the red skirt is more versatile. On its own, this white dress is a bit short for my taste. Most of the time I wear it with leggings and jeans. But I does look cute on its own! 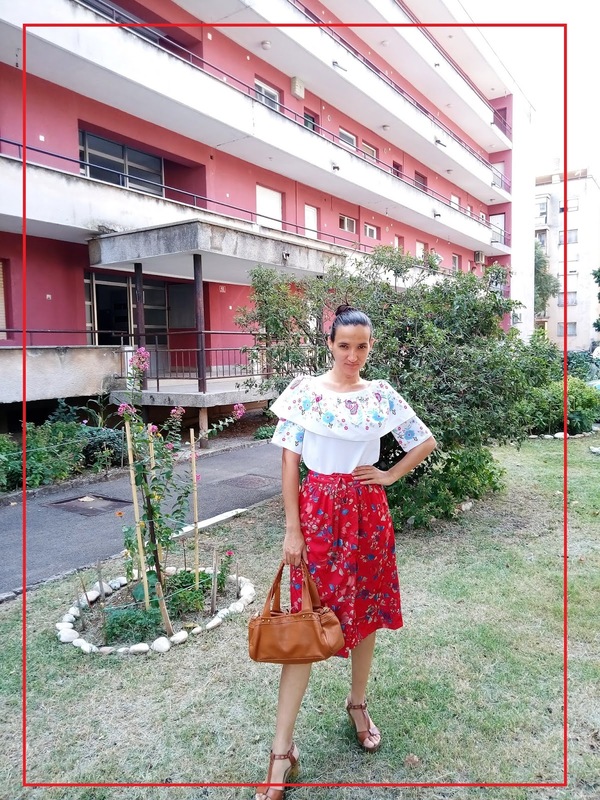 If you scroll down, you'll see how I styled this vintage red skirt on its own. The photograph bellow shows me wearing it over a romper! I find rompers very practical in Summer, and I often pair them with skirts. Rompers can be used as tops in the same way as dresses. It's a great way to save on packing and closet space. It's fun figuring out different ways to wear something, isn't it! Hi dear? i love both styling. I like it better as a dress. I also think such pieces are so great to have in a wardrobe since they can be restyled in different ways. Kisses! That is such a lovely dress and it looks great with the skirt over it! It's a nice combination of colours as you said too. I like the skirt over dress trick if a dress is too short, haha! :) Easy to throw a maxi skirt over it. thank you Mica. It's a perfect trick if a dress is too short. 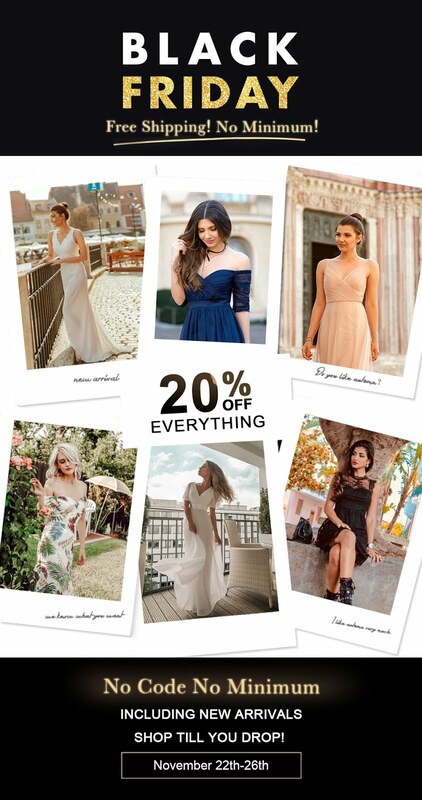 You shared some great tips on ways to style dresses. One that I also like is to wear a dress with a faux leather jacket. I feel like it gives it a different vibe. yes, it does! A faux leather jacket always add rock chic to everything. I like how you transform your clothes, you turn a dress on top and you get more advantage to what you have in the wardrobe, the white dress is beautiful! thank you Rebeca. I love transforming my clothes, it's so much fun. Such a great idea with the first outfit and both are gorgeous! You look wonderful! Love the combination of outfits! have a successful day too! Grande idea quella di usare l'abitino bianco come blouse... ma indossato da solo è delizioso e ti sta da urlo! I love this white dress! It's so cool! Ivana....this is pure brilliance!! I love this idea and have styled it once or twice, but I tend to forget about it!! Yet you've pulled the colors together wonderfully and it looks so perfect!! wowww you give so many styling ideas, I'm impressed. But I have to confess that I like to see the dress just the dress. But you prove us the versatility of the clothes. I LOVE how you are mixing and matching! The white offshoulder-dress is pretty, the Skirt is pretty with and without the red top - and the mix wite dress, red skirt is perfect and creative!!! I also love to mix an to max as you know and it's always inspiring for me to see your suggestions! Thank you for joining in the link up! I totally agree about red and white being a winning color combination! It's just so chic and fresh! I love your idea to wear your off the shoulder dress as a top with a skirt. Creative layering like that just opens up so many different outfit combinations. The second outfit is my favorite! I really love how you combine it with pink shoes. They are so stylish and beautiful! You look really pretty with the off-shoulder style. I really love wearing this style during warmer seasons, especially with dresses. I love your dress with the pink heels. yes, it is fun wearing it during the warmer seasons. thank you dear! You're very kind. Like how creative you styled the off shoulder dress, I'm all for versatile outfits and this is lovely. Hello Ivana, as usual I'm impressed by your creativity! 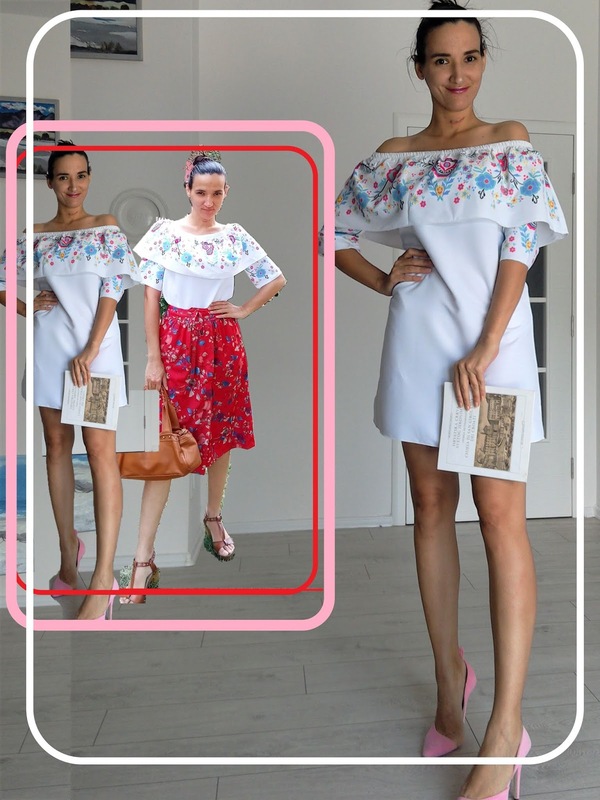 You are right - a matching set must not necessarly be worn together and you had really a great idea to wear the white off-the-shoulder dress as tunic together with the skirt. 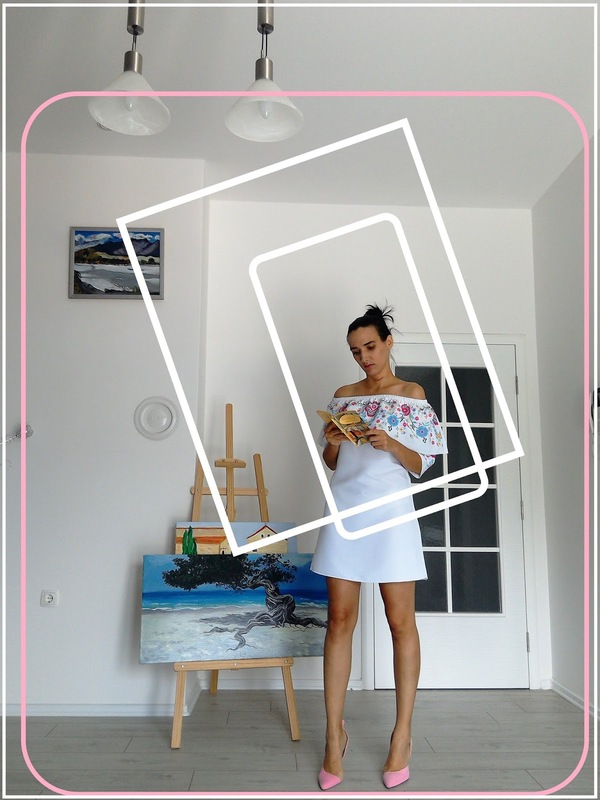 The combination is beautiful and I love also the dress without any other garment (despite the beautiful pink shoes). Thanks for sharing your inspirations! thank you Kezzie. The romper look is a bit old, but I might repeat it because it's fun. I love all looks, but my favorite is the white with the pink heels. L'abito bianco ti sta benissimo ma è molto bello anche con la gonna. Ottima combinazione! It looks lovely! You styled it beautiful! I vise nego da mi se dopada nacin na koji su ove slike uredjene! Samo tako nastavi!